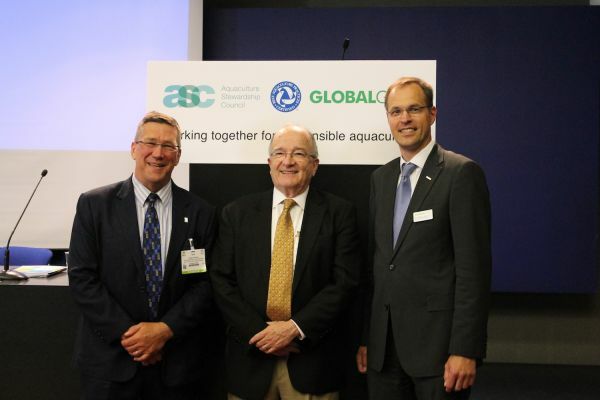 Thursday, May 8, 4:00 p.m.—As the 2014 edition of Seafood Expo Global came to an end, representatives of GAA, the Aquaculture Stewardship Council and GLOBALG.A.P. met to frame the next steps toward achieving efficiencies across the three certification programs. It’s been one year since the three organizations signed a memorandum of understanding (MoU) in Brussels, agreeing to work collaboratively to increase efficiency and reduce duplication in the auditing process to make certification accessible to more farmers and processors worldwide. There is still a substantial amount of work to do, but the three organizations jointly published a statement providing an update and laying out the next steps of the MoU. Pictured above, from left to right, are ASC CEO Chris Ninnes, GAA Executive Director Wally Stevens and Kristian Moeller, managing director of GLOBALG.A.P. Thursday, May 8, 10:00 a.m.—Day 3 of Seafood Expo Global is under way. Again, GAA is in stand 9-4062. Wednesday, May 7, 4:00 p.m.—Congratulations to Marine Harvest Chairman Ole-Eirik Leroy, who IntraFish just named its 2014 Person of the Year at Seafood Expo Global. Leroy was a keynote speaker at GAA’s GOAL 2013 conference in Paris, France. Wednesday, May 7, 11:00 a.m.—Thanks to Produits de la Mer and SeafoodSource.com for the article in the Day 2 daily magazine at Seafood Expo Global. 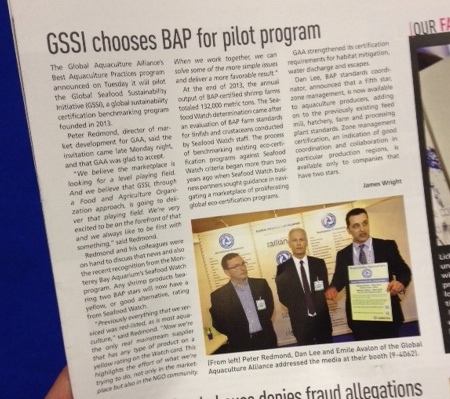 The article is about GAA accepting the Global Sustainable Seafood Initiative’s invitation to participate in a GSSI pilot testing program. Wednesday, May 7, 9:45 a.m.—Day 2 of Seafood Expo Global is just 15 minutes away. Visitors to GAA stand 9-4062 will notice a five-minute video displaying an introduction to GAA and its Best Aquaculture Practices third-party certification program, featuring interviews with GAA Executive director Wally Stevens, GAA President George Chamberlain, BAP VP of Market Development Peter Redmond and BAP VP Lisa Goche, all of which were shot at Seafood Expo North America in March. The video made its debut here in Brussels yesterday. Thanks to Cooke Aquaculture/True North Salmon, Marine Harvest Canada and Tassal Group Ltd. for providing footage of salmon farms and processing plants, and to Wegmans Foods Markets for allowing GAA to shoot in its Northborough, Massachusetts, USA, store. And thanks to Nightlight Productions for producing the video. 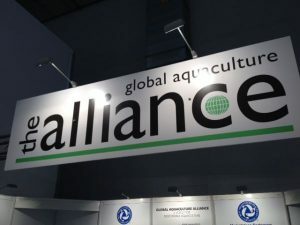 Tuesday, May 6, 6:00 p.m. — As Day 1 of Seafood Expo Global came to an end, GAA announced that R.H. Ward (Welton) Ltd.’s tilapia farm, The Fish Company, in the United Kingdom is Europe’s first tilapia farm to attain Best Aquaculture Practices certification. It’s also the United Kingdom’s first aquaculture farm to achieve the distinction. Located in Welton Cliff, Lincolnshire, the farm has been in operation since 2007. It’s a green operation — the tilapia are reared in a centrally heated recirculating system inside a custom-built 1,080-square-meter facility heated by a waste wood biomass boiler and partially powered by a 45-kilowatt solar photovoltaic array. Also, thanks to Seafood.com, Intrafish.com, SeafoodIntelligence.com, Aquaculture Asia Pacific magazine and others for attending the press briefing. Tuesday, May 6, 11:30 a.m. — GAA’s 30-minute press briefing just wrapped up. GAA Executive Director Wally Stevens, BAP VP of Market Development Peter Redmond, BAP Standards Coordinator Dan Lee and Emil Avalon, BAP business development manager for Europe, updated journalists from the seafood trade press on the latest GAA and Best Aquaculture Practices news. The newest piece of news came from Redmond, who announced that the Global Sustainable Seafood Initiative (GSSI) has invited GAA to participate in a GSSI pilot testing program to be conducted in the latter half of 2014. The invitation came just yesterday, and Best Aquaculture Practices is the first certification program to publically accept the invitation. GSSI is a global sustainability benchmarking organization founded in 2013. The pilot testing program is designed to test and validate the GSSI benchmarking process as credible, achievable, verifiable and practical, and to create awareness and prepare participating certification schemes for application of formal benchmarking after the official launch of the GSSI benchmark tool in 2015. “We believe the marketplace is looking for a level playing field, and we believe that GSSI, through a [Food and Agriculture Organization] approach, is going to deliver that playing field. So we’re very excited to be on the forefront of that. We think it’s going to be a good journey and one that’s going to have a very positive [outcome],” said Redmond. Leadership “is the greatest legacy that we can leave,” said Stevens. Also discussed at the press briefing was BAP two-star-and-up shrimp recently attaining equivalency to Monterey Bay Aquarium Seafood Watch® Good Alternative, GAA’s case study on early mortality syndrome, GAA’s new zone management technical committee, the soon-to-be-finalized BAP hatchery and nursery standards for finfish, crustaceans and mollusks, and May’s BAP seminars in Greece and Turkey. Tuesday, May 6, 10:00 a.m.—The 2014 edition of Seafood Expo Global in Brussels, Belgium, is open! GAA is in stand 9-4062 and is holding a press briefing there in 90 minutes. All journalists and industry professionals are welcomed to attend. Seafood Expo Global is the world’s largest seafood trade fair, featuring more than 1,700 exhibiting companies and attracting more than 25,000 buyers and suppliers, according to event organizer Diversified Communications.